A Chris Smith hat-trick, two Jack Brivio headers and an own goal helped the Hornets to a 6-1 success in Kent which means with their superior goal difference, it will take a huge swing for them to finish outside of the top five. The victory was Horsham's 20th of the season and saw them onto 65 points and up to second in the table. 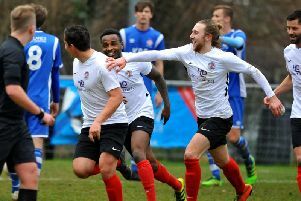 It looked as though that would seal a play-off place as sixth-placed VCD Athletic's were losing 1-0 at Ramsgate until a late turnaround saw them win 2-1. With their four games left and being on 53 points, if they win all of their remaining fixtures they can now only match Horsham's points, but Dominic Di Paola's side have a goal difference of 24 over them. With a place all-but secured, attentions will now turn to amassing as many points as possible for the points-per-game ratio needed for the eventual play-off winners. Horsham brought in Joe Mant in goal having recently signed the stopper as cover due to Josh Pelling being unavailable for the final few games of the league campaign. Will Miles also made his return from his latest injury, possibly slightly earlier than manager Di Paola would have wanted but as a result of Joe Shelley being unavailable through injury. The Kent side came into the game on a run of three straight defeats, while the Hornets were looking for a victory that would take them to within a point of a definite play-off place. The visitor started well with the ball as Sittingbourne showed their physical tendencies early on. That resulted in a yellow card for Kwase Amoah in the 12th minute for his second bad tackle of the game as he was rather fortunate the punishment was not more severe as he lunged in on Will Miles. From the resulting free kick deep from in Horsham’s half, a couple of headers saw the ball drop to Dylan Merchant, but he smashed into the side netting. The best move of the match almost produced the opener on 22 minutes as a neat passing move down the left put Smith away on the angle, but his effort was pushed over by Patrick Lee. The Brickies carved out their best move soon after as Henry Woods was first to the ball on the halfway line and nipped past Miles. His run took him wide, but he managed to spot a good run from Tom Lawrence, but he scuffed wide from 17 yards. Horsham found the opener on 32 minutes as Smith smashed home from close range. A deep free kick from Miles was volleyed back across the box by Sparks and the Horsham frontman was on hand to volley it in. The visitors doubled their lead on the stroke of half-time as, from another free kick - this time from the left - delivered by Harding, Brivio rose highest and nodded home despite Lee getting a hand to it. It was 3-0 on 53 minutes and it came from a fine individual goal from Smith. The striker received the ball on the edge of the box and put in a brilliant turn to lose tow defenders and finished well, high into the net past Lee. In a rare foray forwards, Sittingbourne carved out a chance on 63 minutes when Steve Metcalf was penalised for handball. The resulting free kick saw Tommie Fagg head narrowly over the ball. Horsham added a fourth in the 80th minute as Harding skipped through the Sittingbourne defence and fired the ball across goal from the tightest on angles on the byline and it was turned into his own net by centre-back Lex Allan. Four minutes later it was 5-0 as Lee was penalised for a foul in the box after a short backpass and Smith dispatched the resulting penalty to complete his hat-trick. And they weren't finished there, Brivio headed home another free kick with two minutes left to play to make it 6-0. However, the hosts did spoil the party late on as Mant was denied a clean sheet by allowing a tame effort from substitute Billy Lewis in added time. Sittingbourne: Lee, Webber, Morrell, Allan, Fagg, Amoah (McFarlane 37), Adebayo (Phillip 55), Lawrence (Lewins 60), Campbell, Woods, Toluwanile. Unused subs: Spencer, Caney-Bryan. Horsham: Mant, Metcalf, Miles (Hyde 65), Merchant, Sparks, Richardson-Brown, Brivio, Hayward, Harding (Taylor 78), O'Toole (Lavery 70), Smith. Unused subs: Lovegrove, Pearse.